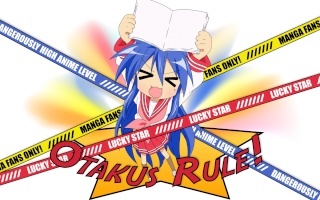 First, pay no attention to the picture above, Lucky Star is nowhere near as action-epic as that. 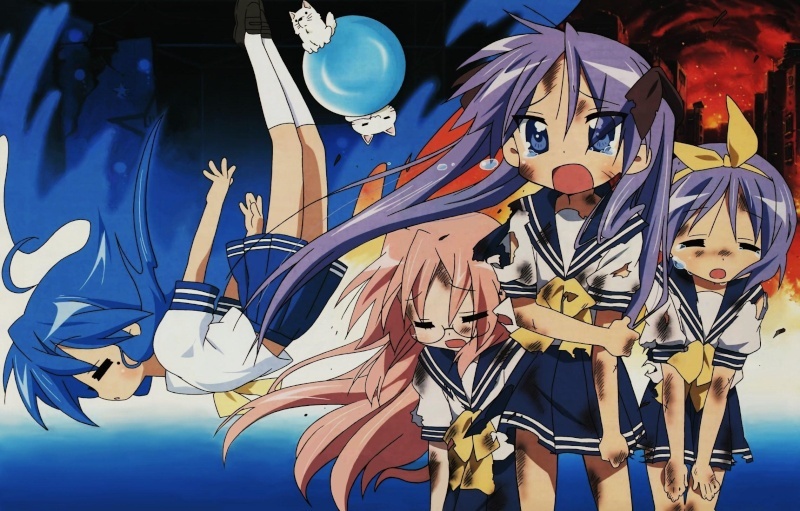 Lucky Star portrays the lives of several school girls attending a Japanese high school with a very loose humor tone. The main protagonist is Konata Izumi, voiced by the famous idol Aya Hirano. Kagami Hiiragi, Tsukasa Hiiragi and Miyuki Takara are her best and closest friends. This moé-tsukkomi anime revolves around constant skits performed by the girls. Though time does move and they get older and move up in high school, the pace of the anime stays so slow that you cant help but ignore the timeline and get caught up by the banter, jokes and mischievous happenings that the girls get into. I highly highly highly highly highly HIGHLY recommend watching this anime. It is for everyone. It\'s a break from the action filled, blood sucking, limb slicing, kamehameha blasting action anime\'s that most people watch. 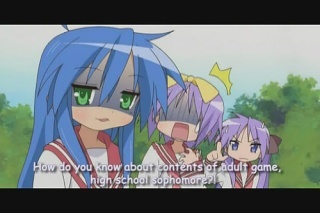 Although its slow to start, dont get discouraged as you\'ll soon get sucked into the world of Lucky Star and the pranks and jokes of Konata and her companions. I\'ve watched this anime over so many times that I\'m well into the double digits number. Its just that freaking good. Theres so much to be said about this moé-tsukkomi anime, but you really do have to watch it to experience the epicness that is Lucky Star for yourself. This is by far one of my favourite anime\'s and I really recommend you watch it. 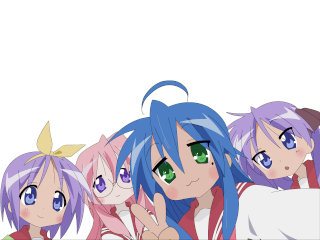 What did you think of Lucky Star ? Anything I should add ? I'd love to hear your comments and feedback !